Back in 2015, we were enthusiastic proponents of a deal with Iran. Our basic point was simple – Balance of power in the Middle East was an important American objective and the inability to work with Iran was hurting that objective. Remember what was the greater danger at that time – ISIS. The stunning & rapid advance of ISIS into Iraq had threatened to unravel Iraq. That was simply unacceptable to America. It was even more unacceptable to Iran which viewed ISIS as an existential threat. This mutually reinforcing need served as the driver for the US-Iran deal. America & Iran worked together using Iranian & Iran-backed Shia militias with American airpower to remove the ISIS threat from Iraq. A variation of this was used in Syria. US-backed Kurds stepped in to fight ISIS on one side in Syria and Iran-backed Hezbollah led the ground fight against ISIS on another side in Syria. It was a brutal and devastating war for both ISIS & Hezbollah in which Russian air power proved crucial. The fighting capability of ISIS was destroyed and so was the caliphate ISIS had built. Unfortunately for America and, even for Russia, the result was that Iran became dominant in Syria and Assad became virtually obedient to Iranian demands. With its dominant position in Iraq and its hard earned strength in Syria, Iran seemed poised to become a hegemon in Syria with its captive partner Hezbollah becoming a hegemon in Lebanon. As a result, US policy in Syria seemed destined to become a static fettered policy instead of an agile policy based on balance of power. The $150 billion or so released by America to Iran now became a sustaining platform for Iranian power grab in Syria & Lebanon. While this was unacceptable to America, it was existentially intolerable for Israel. Once the threat from ISIS was extinguished, Israel reemerged as the absolutely unacceptable entity for Iran. So a conflict between Israel & Iran was only a matter of time. While Iran was virtually free to increase its activities in Syria & then Lebanon, America was hamstrung by the deal it had signed with Iran. The $150 billion released to Iran were used to benefit European & Chinese companies. So US allies like EU and US competitors like China urging US to stay in the US-Iran deal. Unfortunately for Iran, the American President was Trump who likes using disruption as a tool and not Obama who, like Hamlet, had a horror of disruptive action. Naturally President Trump walked away from the Iran deal this past Tuesday without destroying the deal entirely. This decision frees America & American foreign policy while keeping Iran bound & fettered to the restrictive nuclear deal. Keeping EU, China and other countries in the Iran deal is extremely important to Iran, at least at this stage. Iran doesn’t want EU to join in financial sanctions against Iran and Iran doesn’t want to give America an excuse to attack Iran by walking away from the nuclear restrictions imposed by the Iran deal on Iran. So American policy is now free while Iranian policy is hamstrung. 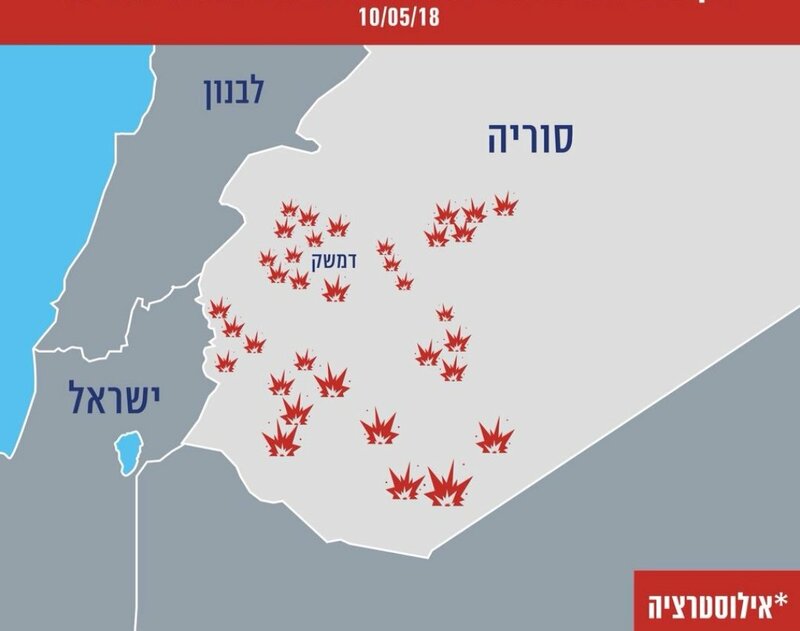 America walking away from the Iran-Nuclear deal has also freed Israeli policy in Syria. This is not just good for America but also for Russia. It is an open secret that Russia is very unhappy with Iran’s objectives in Syria. Russia wants to reduce its footprint in Syria while retaining its naval-air bases in coastal areas. Russia wants a semi-secular regime the way Assad regime used to be. On the other hand, Iran wants to increase its military & political footprint in Syria and wants the Assad regime to become an Alawite, pro-Shia & anti-Sunni semi-religious regime. So both America & Russia have a common objective in Syria – to reduce the power & influence of Iran. But neither can act without forcing the other to react. But Israel can without causing an image problem for Russia as long as Israel attacks Iranian installations & bases in Syria. Witness how Russia threatened to equip the Syrian military with advanced S-300 system after America dropped missiles on Syria while Russia actually made noises about not supplying Syrian military with S-300 after Netanyahu met Putin and even after Israel pounded Iranian installations in Syria. So Israel made full use of the Iranian mistake of launching 20 odd ineffective rockets against Israel. Empires die when the costs of imperial overreach into foreign areas become too onerous for the people and the state. Soviet Union slowly deteriorated on the inside from its imperial overreach. Dangers of overreach are equally serious for mere regimes, especially regimes like today’s Iran. Years of sanctions had already created havoc with the economy and currency. But that was before the risk of new sanctions. 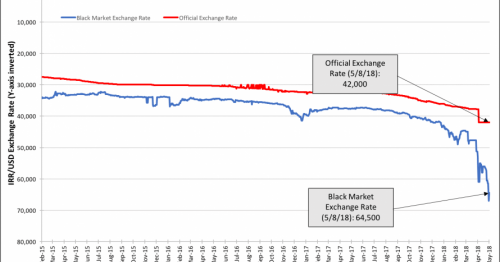 Look what the real market is today for the Iranian currency? 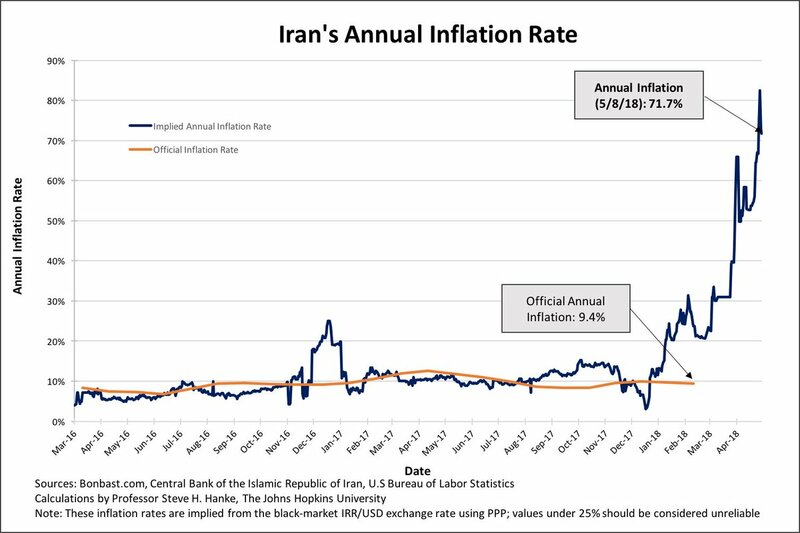 JP Wells 🇺🇸‏ @JPW3775 May 9 – Why the Iranian leaders are so upset w/ @realDonaldTrump tearing up the #JCPOA #IranDeal: Going back to sanctions means 75% inflation in real terms which will put Iran close to #Syria or #Venezuela levels of misery. All that for atomic energy?? If the currency is in such a state, how bad is inflation? And this is before the Trump Administration begins imposing new & far more intense sanctions on the Iranian economy. Kim Jong Un buckled even though he did not face intense unrest from an aware population. The Iranian regime is at much greater risk. They have already faced one bout of unrest which they put down with brutal force. How much economic misery will Iranian people tolerate before it gets too much? The Kim family regime had a simple objective – keep personal power. They did not have greater goals for which they would give up their personal power. So making a deal with them is, hopefully, easy & desirable. Such a deal avoids the huge “break it & you own it” risk. The Iranian religious regime is very different. It is a deeply religious regime with almost fanatical zeal to keep Iran religious and to remove the state of Israel as an entity from Muslim Middle East. You can make tactical deals with this regime such as the one to get rid of ISIS. But a strategic long term deal with such a regime is very very hard. But not impossible. We can see the Trump Administration come to a strategic deal with this Iranian regime if the regime withdraws from its external ventures & focuses its energies on delivering prosperity to its people. That means letting Hezbollah go, getting out of Syria, stopping its activities in Yemen and even withdrawing from the Sunni regimes in Iraq. Until that happens, we think the Trump Administration will keep intensifying its financial war against Iran. Why is Trump still in bed with the Saudis. Saudi Arabia is equally guilty of promoting terrorism and committing atrocities both, abroad and in their own country. The entire Syrian conflict is predicated on the oil pipeline operated by Shi’a interests competing against sunni oil interests and in the final analysis against the US interest pitted against Russian energy supplies to Europe.